"Hey, if she wants to play lumberjack, she's going to have to learn to handle her end of thelog." 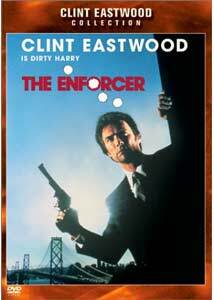 The Enforcer marks Clint Eastwood's third outing as "Dirty" Harry Callahan, the gritty, rule-bending, San Francisco cop with a wry attitude. In retrospect, I think the idea of actually making sequels to the original Dirty Harry film was probably a bad one, but what's done is done. While the first sequel, MagnumForce was a tightly crafted thriller with a very strong central story, TheEnforcer seems to be a child of a different generation, opting for fast pacing, loads of action, and lots of humor. The storyline, almost James Bondian in its absurdity, is a bit out of place, but provides ample excuses for gunplay and chases. After the dark tone of the first two outings for Detective Callahan, the slightly lighter mood here seems an attempt to appeal to a broader audience. As the film opens, Harry Callahan is not only in trouble at work yet again, but a group of crazed, so-called "revolutionaries" are making plans to go on a rampage of chaosthroughout San Francisco as some kind of extremist political statement. When Callahan's longtime partner is killed by these extremists during a major weapons theft, Harry vows revenge and, surprisingly, is given some support by his superiors. The criminals soon make unusual ransom demands and eventually hatch a scheme to kidnap the mayor. While Callahan follows a trail of clues to locate these homicidal crazies, a sub-plot pops up in which he is partnered with a female police officer, played by actress Tyne Daly (later to find fame on Cagney & Lacey as a cop). Callahan seems wary of having women on the force, in his usual old-fashioned style, but worse, suspects his lightly experienced partner has only been promoted to fill quotas. Many things make The Enforcer a much different Dirty Harry, but the level of humor, especially Callahan's near-constant one-liners, really sets it on it's own. Many of the action sequences are dotted with sight gags or other unusually light-hearted things; Harry seems less of a cop and more of a wild adventurer, always getting into trouble. Unfortunately, Tyne Daly's character suffers the brunt of jokes. I suppose in 1976, the incredibly weak portrayal of a semi-inept female police officer was thought of as "broad minded" because it was better than nothing, but it falls on the offensive side by today's standards. She basically can't do much of anything properly or without sputtering about, and never really gets a chance to show Harry that's she's made of stronger stuff. Given the time and mood of 1976, take that for what it's worth. Ironically, while on Cagney & Lacey, Daly would work with Ted Post, director of MagnumForce. Only Clint Eastwood's rock-solid metamorphosis into this role carries the film,especially since his enemies this time—the weird, drugged out "revolutionaries"—are not exactly confidence inspiring. In fact, they're a bit ridiculous as central villains. Their grandiose plans of laying waste to San Francisco with rocket launchers sounds like a far reaching attempt to make The Enforcer sound more elaborate or epic than it is. It's hard to really trash the movie, though, since it's well-directed and so much fun to watch especially since Eastwood plays straight-man to this weird story. It might not be quite the same level of "classic" as Dirty Harry, more of an attempt to make him into an all-purpose hero, but it's still very entertaining and distinctly Eastwood. Image Transfer Review: The Enforcer is a very impressive master of a fairly aged piece of work. Widescreened and anamorphically enhanced, a great deal of obvious cleaning-up wasapplied to the image, making it look much more film-like and vibrant than otherversions. While there is still a good amount of grain as well as dirt on the negative, it's afairly fleeting glitch. Overall, you have a visible increase in clarity and detail, with noartifacts or compression problems. A few scenes look a little blurry, but it appears to be aresult of a strange, multi-depth focus lens used in certain scenes. Audio Transfer Review: The new Dolby 5.1 mix is of extremely high quality for a film of this age. Rather than a very obvious, exaggerated mix filled with multi-channel gimmicks, it's very subtle and well designed. There is plenty of directional action and surround effects, but they all feel totally natural, whether it's the ambient noise of the streets of San Francisco or gunshots whizzing by your ear. A few times, some of the dialogue felt a bit flat compared to the rest of the soundfield, but it seemed to be limited to only a few brief moments. I wouldn't go so far as to say this is a multi-channel sound demo disc, but it's a good example of an older film being redesigned carefully. A French mono track is included, but isn't terribly good. It's harsh and rather bland compared to the 5.1, the dubbing is also slightly humorous (watching Harry Callahan deliver wry lines in French is entertaining). Extras Review: The 9-minute featurette, Harry Callahan/Clint Eastwood: Something Special In Films is primarily a promotional program made in 1976, discussing both the impact of the character on film along with advertising for the Enforcer. It's about what you'd expect from such an old, promotional piece, but does have someinteresting material relating to making the movie and some discussion with cast andcrew. A theatrical trailer is on the disc, along with some text on the overall production and some filmographies. The presentation is decent, in a snapper case with chapter listings. There are 8 subtitle languages as well. The Enforcer is, in my opinion, the last of the tolerable Harry Callahan movies, and what a strange ride it is. While it lacks some of the class of the previous two films, you can't go too wrong with this action flick... and it's got quality audio/video to boot. "Do ya feel lucky punk?"